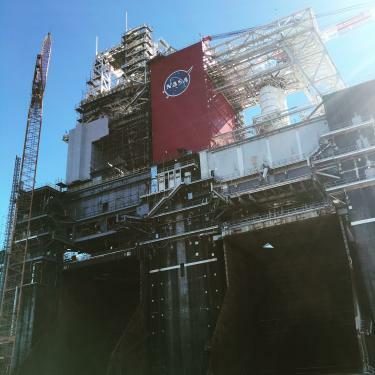 Last month Stennis Space Center celebrated 50 years of engine testing right here on the Mississippi Gulf Coast. Did you know Stennis is the largest rocket propulsion test center in the country? We had the chance to learn this and a lot more at a NASA Social held at Stennis in February. NASA Social events are designed to provide opportunities for NASA&apos;s social media followers to learn and share information about NASA&apos;s missions, people, and programs. The NASA Social we attended was on the day of the State of NASA Address. We listened to NASA Administrator Charles Bolden give the address from Langley Research Center in Virginia. After the address, Deputy Director at Stennis Randy Galloway answered any questions the group had. From there, the real fun began. We spent the rest of the afternoon exploring test stands and the assembly facility. First up was B Test Stand. We ended the day touring the Aerojet Rocketdyne Engine Assembly Facility where general manager Mike McDaniel showed us the ins and outs of assembling rocket engines. Want to get a glimpse of the life of an astronaut? Be sure to add Stennis Space Center and a NASA Social to your itinerary on your next visit to the Mississippi Gulf Coast. By purchasing a ticket to INFINITY Science Center, visitors can also explore Stennis on a bus tour. NASA Socials are periodically, and attendees do have to register and apply in advance. Check here for upcoming socials. We hope you have an out-of-this-world experience at Stennis. As they say, you can’t go to space without going through South Mississippi first!